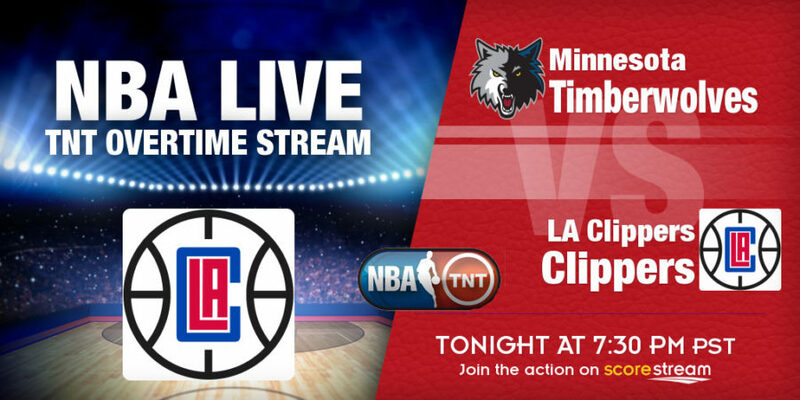 LOS ANGELES – The Los Angeles Clippers will aim to stay undefeated in 2017 when they take on the Minnesota Timberwolves live on TNT Overtime on Thursday night. Tip-off time for this fixture is set for 10:30 pm ET, and it will be the second game of a double-header streaming live on TNT Overtime tonight. New York Knicks will host the Washington Wizards in the first game at 8:00 pm. The Clippers (29-14) enter this game on a seven-game winning streak, but will have to try to extend that run without leading point guard Chris Paul, who is out for six-to-eight weeks with a thumb injury. Paul, who recently returned from a hamstring problem, suffered another setback on Monday night in a 120-98 victory against the Oklahoma City Thunder when he sprained his left thumb and underwent surgery Wednesday morning. Raymond Felton, who is averaging 7.2 points per game and scored 15 points and dished out six assists against the Thunder, is expected to start for Paul, while Austin Rivers will share the ball handling duties. Minnesota (14-28), meanwhile, enters this game on a two-game skid, following defeats to the Dallas Mavericks and the San Antonio Spurs on the road. The Timberwolves are 5-15 away from home this season and are expected to struggle against a Clippers team that is 17-6 at Staples Centre this term. Karl-Anthony Towns, who is averaging 22.0 points and 12.0 rebounds this season, and is coming off a 27pts and 16rebs performance in the defeat to the Spurs on Tuesday, is the main contributor for the Wolves this term. Three other players, Andrew Wiggins (21.6) and Zach LaVine (20.1) are also averaging 20-plus points this season. Meanwhile, the other TNT Overtime live streaming game will come from Madison Square Garden in New York, where Carmelo Anthony and the Knicks will try to build on the 117-106 win over the Boston Celtics on Wednesday night. Derrick Rose matched his season high with 30 points, pulled down 10 rebounds and had five assists to help the Knicks (19-24) stopped a two-game skid. It will be the second of four meetings between the Wizards and New York this season, with Washington taking the first the meeting 119-112 on Nov 17. In another NBA game on Thursday night, the LeBron James and Kyrie Irving will lead the Cleveland Cavaliers against the visiting Phoenix Suns. The Cavs were beaten 126-91 by the Golden State Warriors in the last outing. Elsewhere, Dallas is at Miami and San Antonio entertains Denver. Karl is one the top NFL and basketball contributors for SportingAlert.com. He enjoys relaxing at the bench in Miami, as well as spending time with his family when he is not busy providing fresh content for publications. Follow Livescores from several sporting events, including Soccer, Football, Basketball (NCAA college basketball, NBA and European Leagues), as well as Cricket and Tennis - on www.livescores.com and www.livescore.com. If you're on the go or just wanting to stay up-to-date at home or at work, livescores.com and livescore.com is a top option. They are also Mobile friendly, so if you have an iPhone or Android device you can download the Apps for free. Latest college football and college basketball news, previews, reviews and scores. Stay up-to-date with the latest tournaments live ESPN3 and WatchESPN which provides live streaming. Live NFL TV channels and scores every weekend.